June 18, 2015, Mumbai: Hansa Customer Equity, which provides consulting services in Customer Strategy, Data Management, Analytics, Campaign Management, CRM & Digital Services to leading brands has raised Rs. 30 Crore from PE firm ASK Pravi to fund its next phase of growth. Hansa Cequity was incubated and promoted by R K SWAMY HANSA Group along with S.Swaminathan (ex-iContract, part of JWT, India) and Ajay Kelkar ( ex-CMO of HDFC Bank) seven years ago. R K SWAMY HANSA Group is amongst India’s largest marketing services groups which includes leading ad agency R K SWAMY BBDO amongst other marketing services companies. ASK Pravi is a leading domestic mid-market private equity fund focusing on unlisted companies which benefit from India’s consumption potential. This is the fund’s sixth investment. Hansa Cequity has expertise in BFSI, Retail, Auto, DTH verticals and is poised to expand across various industry verticals. “Our platform-as-a-service (PaaS) strategy aims to bring in proprietary product APIs & solutions to enable customer-intelligence on demand and drive real-time marketing for our clients. We have benchmarked ourselves against global firms like Merkle, Acxiom, & Harte Hanks and the opportunities are really exciting,” says S. Swaminathan, CEO Hansa Cequity. “We are looking at global expansion into key markets where data-driven marketing is increasingly gaining attention of CMOs & CIOs. By 2017, CMOs are expected to invest more in marketing technology than CIOs. This will help us bring-in cross learnings & global best practices across developed and emerging markets.” says Ajay Kelkar, COO Hansa Cequity. “We are extremely delighted to invest in Hansa Cequity. They have best-in-class customer/marketing analytics & customer relationship marketing capabilities. With the new strategic areas identified they will bring-in a competitive edge to their services in the marketplace,” says Anand Vyas, Managing Partner, ASK Pravi. 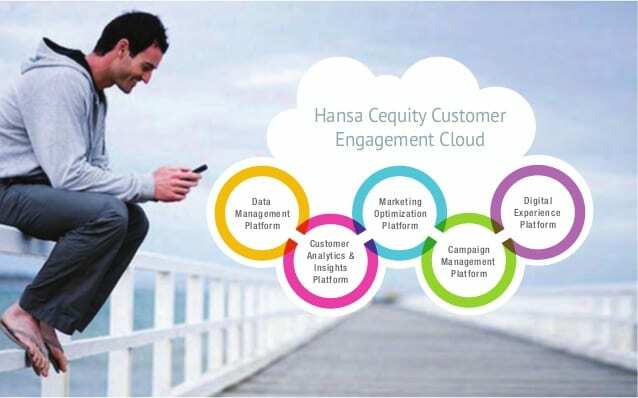 Hansa Cequity has a deep focus on CRM, Social, Mobile, Analytics & Cloud (SMAC). The size of the overall SMAC industry globally will be close to $1 trillion by 2020. With increase in big data & social, the need for real time, on-demand analytics and marketing automation is getting increasing attention in company board rooms. Hansa Cequity is India’s first marketing services company and is part of the RK Swmy | HANSA Group. Currently, the company has 85mn unique customer profiles, facilitates transactions worth $75bn, analyzes 5mn customer conversations and has more than 750 automated campaigns running every week. The unique customer intelligence marketing company has been co-founded by Mr. Ajay Kelkar veteran in Business and Marketing across consumer goods, retail and the banking sector, and Mr. S Swaminathan, strategic expert in customer relationship management. Mr Kelkar serves as the COO of Hansa Cequity and Mr Swaminathan is the CEO of the company. Hansa Cequity helps companies across verticals to intelligently connect with their customers. Some of the renowned clients include Croma, Celio, Hypercity, Westside, Axis Bank, Birla Sun Life, Tata Sky and many more. ASK Pravi Capital Advisors, a joint venture between ASK Group and Pravi Capital, is the investment manager of ASK Pravi Private Equity Opportunities Fund. The Fund focuses on fast growing unlisted businesses which benefit from domestic consumption demand. It pursues an “Active Investing” approach to closely manage and nurture its portfolio companies while providing them with growth support through its team of investment and operating professionals.